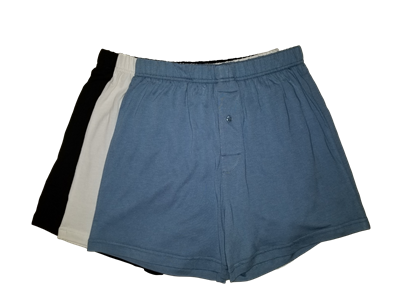 There’s no better way to secure your valuables than with this pair of ultra-soft and organic boxer shorts. Start with one pair, and soon you’ll need seven. Elastic waistband. Softness where it counts. There’s no better way to secure your valuables than with this pair of ultra-soft and organic boxer shorts. Start with one pair, and soon you’ll need seven. The bamboo boxers are one of our absolute favorites, and one of our top sellers. Elastic waistband. Softness where it counts. Machine wash cool water, gentle cycle, mild soap. Tumble dry low. For nearly a decade we’ve been selling bamboo boxers, and they continue to be one of our most popular products. But it’s fun to watch people react. First, people hear the term bamboo underwear, and they laugh. Yeah, it sounds funny doesn’t it? And somebody always feels obliged to make a joke about getting a splinter. Ha ha. Then they decide to give it a try, and they take home a pair. About two weeks later, give or take, the customer comes back. This time it’s no joke. They need more bamboo boxers because they’re the most comfortable underwear they have ever worn. Sometimes it’s just for one or two pairs, slowly phasing out the old undies and replacing them with bamboo. Other times it’s more like five or six pairs, because frankly, once you’ve worn bamboo boxers it’s pretty hard to go back. Now I personally prefer the boxers, but I should mention that our bamboo boxer briefs are the slightly more popular of the two. Ultimately it’s matter of personal choice. I actually keep a couple pair of boxer briefs in the drawer, one white and white black, just to mix it up once in a while. I can’t think of a better way to enjoy the properties of bamboo fabric: hypoallergenic, anti bacterial, and so so soft. Bamboo: fabric from a fast-growing grass. People are often surprised when they learn how much pesticides and herbicides are used in the cultivation of conventional cotton. Alternatively, bamboo, produced in its native habitat just grows and grows. No need for crop-dusters, no drought-defying irrigation, just a forest of grass. And when it’s harvested, cut down, it grows right back. Sustainable and comfortable. Soft on the skin and good for the soul.